Very few patients even notice our state-of-the-art dental technologies, and we consider that to be a good sign. At Friendswood Dental Group, our purpose in investing in new dental techniques and technologies is always to make the dentistry services we provide more comfortable and effective while improving patient convenience. To find out more about how Dr. Sierra uses advanced dentistry technology to improve your dentistry experience, keep reading or contact our dedicated team today. Possibly the most important technology we’ve integrated into our practice is digital x-rays. Unlike traditional x-rays, digital images offer high definition results that are instantly visible on chairside computer monitors. Traditional x-rays offer images of significantly lower quality that need to be developed using hazardous chemicals. Using digital images, we expose patients to significantly less radiation, are able to diagnose potential concerns in earlier stages, and easily transfer x-rays to insurance providers, specialists, and patients. 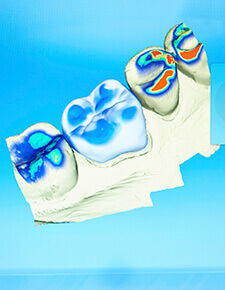 Digital x-rays also allow us to quickly and easily compare patients’ smiles from year to year. When it comes to planning more extensive treatment like Invisalign orthodontics or dental implant placement, our CT/Cone Beam scanner allows us to use 3D digital representations of patients’ full smiles to completely explore each aspect of the bite, how the teeth work together with underlying and structures, and plan for treatment that helps patients achieve their optimal oral health. From guided surgical implant placement to full mouth reconstruction and smile makeovers, our Cone Beam scanner is an indispensable part of treatment planning. Bite impressions are a necessary part of many cosmetic and restorative dentistry procedures including crowns, bridges, inlays, onlays, and veneers. In the past, we used dental putty to collect literal impressions of patients’ bites. While this process is still an effective way to collect this information, our state-of-the-art CEREC system offers a more precise solution – digital impressions. Digital impressions are able to more effectively and efficiently scan every surface of teeth providing accurate representations for the lab or in-office milling unit to produce flawless restorations. When you hear “laser” you might be thinking about science fiction, but lasers are actually utilized in a number of professions to offer more precise results, including dentistry treatments. At Friendswood Dental Group, we utilize the innovative LightWalker laser. This advanced laser technology can be used as part of both hard and soft tissue dental treatments. By using dental lasers, we are able to improve the efficacy of most treatment plans, relieve discomfort during treatment, and reduce healing time. While our advanced digital x-ray technology allows us to diagnose tooth decay in earlier stages, laser technology lets our team discover areas of teeth that are at risk for future decay. We use the DIAGNOdent cavity detection system to help us diagnose softening areas that may be at risk for decay and help patients take action before damage occurs. Additionally, DIAGNOdent offers superior analysis of the areas between teeth than is possible with even the highest quality digital x-rays. Many patients don’t like visiting the dentist, and the thought of needing an injection or hearing the high pitched wine of a dental drill doesn’t help them feel more relaxed. Another use for laser technology we’ve incorporated into daily use is laser dental fillings. Those patients who have minor tooth decay or damage that requires a filling to repair can now experience comfortable, pain free restoration without needle injected local anesthesia or potentially painful drilling. Instead, we use a laser to painlessly prepare teeth, apply a cosmetically flawless composite resin filling, and patients are able to fully restore their smiles in just one appointment without any of the fear-inducing parts of dentistry services.